Sometimes, having a great patio is not enough. There will be days when you’d want to spend time on your patio but the weather is either wet or icy. This is where a patio cover comes in handy. With a patio cover, you can stay as long as you want and enjoy patio activities without worrying that you might get wet or feel too chilly. 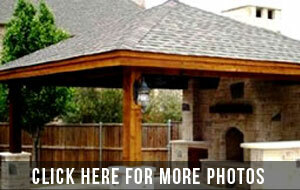 One of Patio Creations’ specialties is building patio covers that suit your homes perfectly. Our Woodlands patio covers come in various styles and may be installed according to your specifications. For instance, you can choose a traditional installation using building materials that are exactly the same as that of the main house. This means full coverage, permanent and is actually having a fixed ceiling over your patio. With this kind of patio cover, you can have a fireplace or firepit added to your patio. But you can also take the option of selecting a non-conventional form of patio cover. Woodlands canopy include awnings, huge patio umbrellas, drapes, fiberglass panels, and pergolas. Awnings are made of thick, tough vinyl or tarpaulin. This is for durability and waterproofing. A nice feature of awnings is that they can come in different colors and design prints. Just like the awning, enormous patio umbrellas offer various colors, sizes, and designs. A very good feature of patio umbrellas is that you can set them up when the weather’s to sunny or there’s a sure sign of rain. You can have one huge patio umbrella over your patio furniture or have several of them placed over patio furniture. Using transparent glass or fiberglass panels as walls and ceiling over the patio creates a weatherproof outdoor living space. You can now enjoy the view of the outdoors without worrying about rain, snow, or heat. You can use drapes or light material to shut out the sun when it becomes too much. Call us today or come to our office so we can discuss the patio cover that will work best for you.